My name is Patrick Kelly and I am the owner of Kelly’s Computer. I graduated from Kaskaskia College in 2000 with a degree in Computer Science. 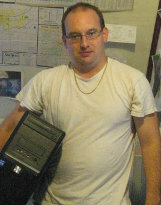 Soon after graduation, I started Kelly’s Computer as a home business offering home computer repair and consulting in my home town of Centralia, Illinois. Many thanks to my customers who supported me during my early days in Southern Illinois. In 2004 I relocated to Ionia, Michigan and brought Kelly’s Computer with me. With over 21 years of experience and Comptia A+ certification, I am ready to tackle the needs of computer users in the West Michigan area.